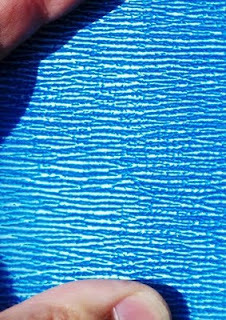 Lemax, who makes lots of small holiday village houses, etc, also make blue water mat for use in their displays. I picked one up cheap during Michael's after holiday sale, I think about 70% off, with plans to use it to make rivers & lakes out of. So far, I've only done 1 test piece, but since someone on TMP asked about them, I figured I'd show what I've done so far. Here is the lake I made. 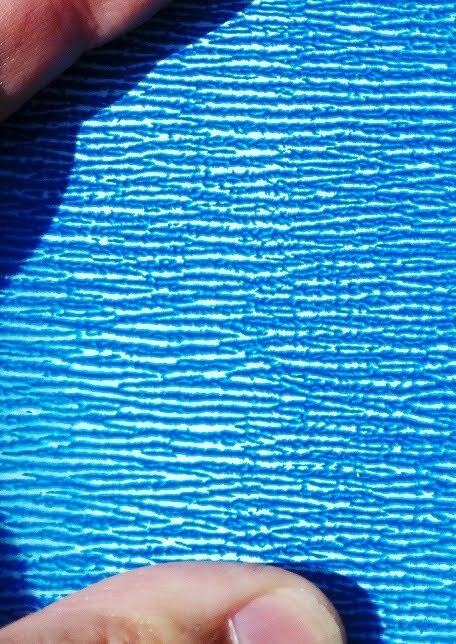 I spray painted some heavy plastic sheet a light blue color & then used spray adhesive to stick the mat down. I decided to spray the plastic blue 1st because the mat directly over the white plastic seemed a bit too stark in contrast between the white & blue. Here's a picture of the mat over some white plastic. 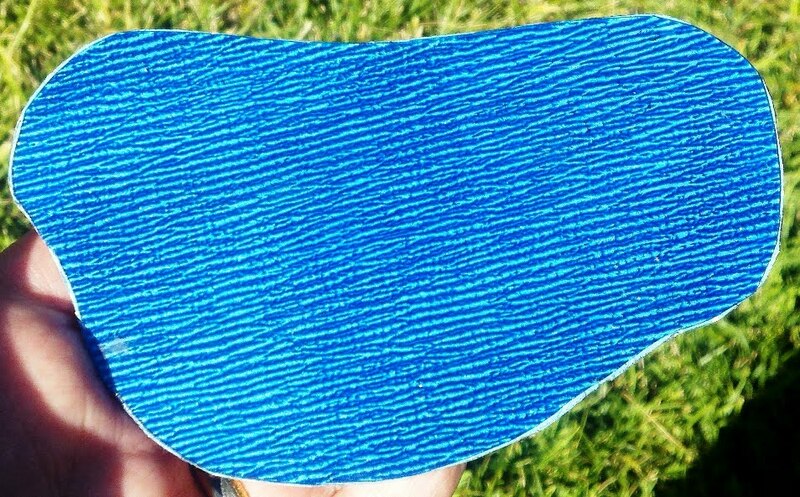 Since the mat isn't flat against the plastic, the contrast between the blue & white might be hard to see. But hopefully you can get the idea compared to the other picture. The blue mat over the light blue color seems to work well. For rivers, I might try to vary the amount of paint sprayed along the plastic to get more variation of the color that shows through. I just need to figure out how to add some sort of green flock/edging around the lake. I'm guessing any basing material or flock won't stick well to the mat. After my 8 yr old daughter saw the very cool Lego army that Rebel Minis posted on their blog, she wanted to do the same thing with Lego knights. But while we waited to find deals on lego people, I remembered I had bought some 2.5D tanks & dinosaur models recently. 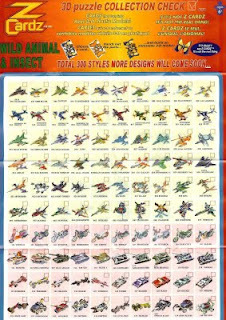 They're made out of styrene pieces that you punch out of a card like the Wizkids' Pirates of the Spanish Main ships. 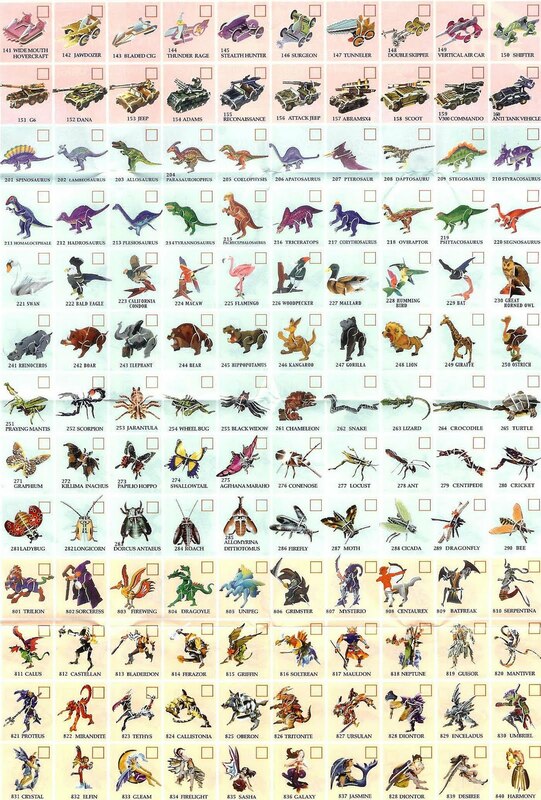 Here are scans of the inserts that came in the packs. There's quite a range of model types. Unfortunately, the website listed on the packs (www.z-cardz.com) goes to an Asian language site with no English info at all. 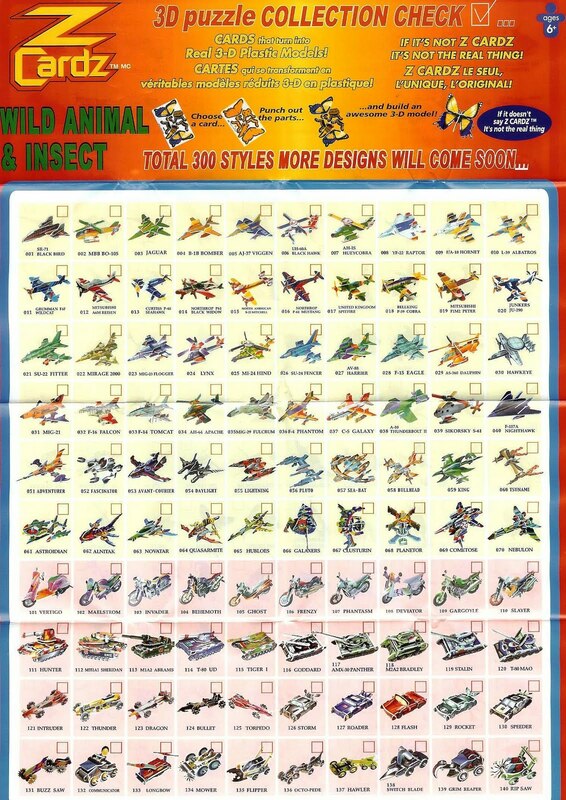 So I can't help track down any of the models. 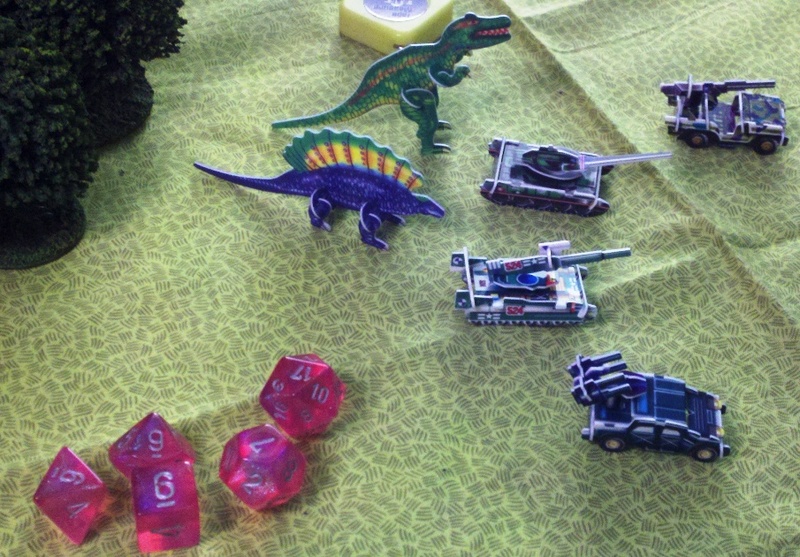 I had 5 packs of tanks & 1 pack of dinosaurs which I quickly snapped together & came up with some rules off the top of my head. 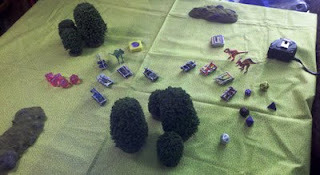 Here's the inital board lay out, & the yellow vs green forces (2 dinos, 2 tanks & 2 smaller tank destroyer vehicles each). The rules were very simple, but it did include measuring for movement & ranged fire (the dinos had a very short but very powerful fire breath), opposed die rolls to resolve combat, & different sized dice for the different figure types (tank destroyers = d6, tanks = d10, dinos = d20). She started off very well with her forces hidden behind the woods. She asked if we could move or see through the woods & I said no to make it simple. She also told me which of the dinos were meat eaters & which were plant eaters, & that the meat eaters should be better fighters. 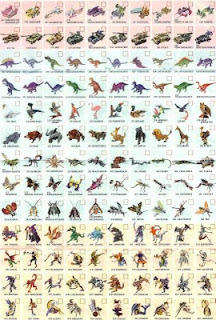 I suggested we have all the dinos be the same for now. She did make the very good tactical move all on her own. She ran her speedy tank destroyers up to hide behind a hill on my flank so I couldn't shoot them. Next turn she had them come over the hill so they'd be in range to shoot my tank, but was smart enough to also keep them far enough back from my forces so I couldn't shoot back (tank destroyers shot 12", but tanks shot 8" just to give the tank destroyers better survivability). 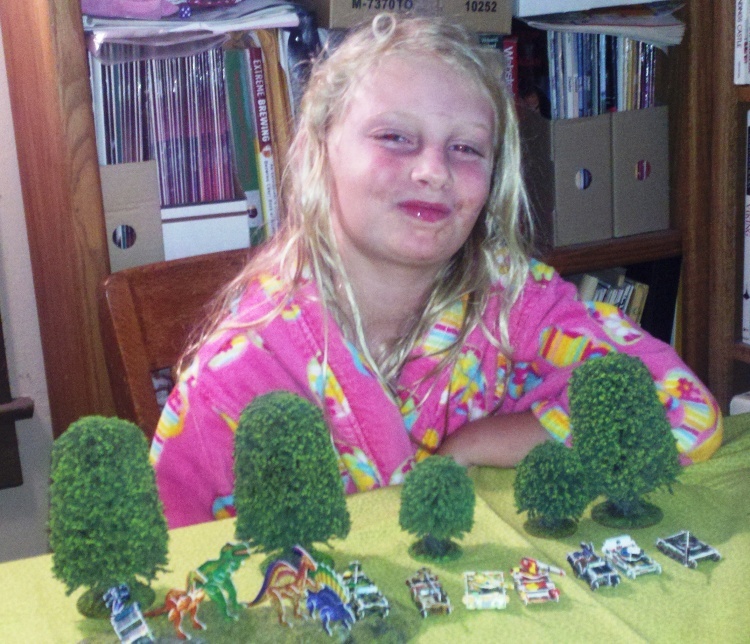 She ended up wiping out all my vehicles at one point. 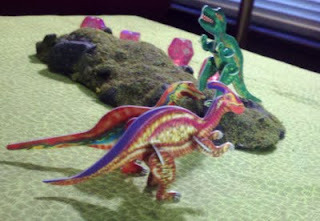 Here is a picture of her forces converging on my 2 remaining dinosaurs. & another of her TRex coming over the hill to flank my dinos. 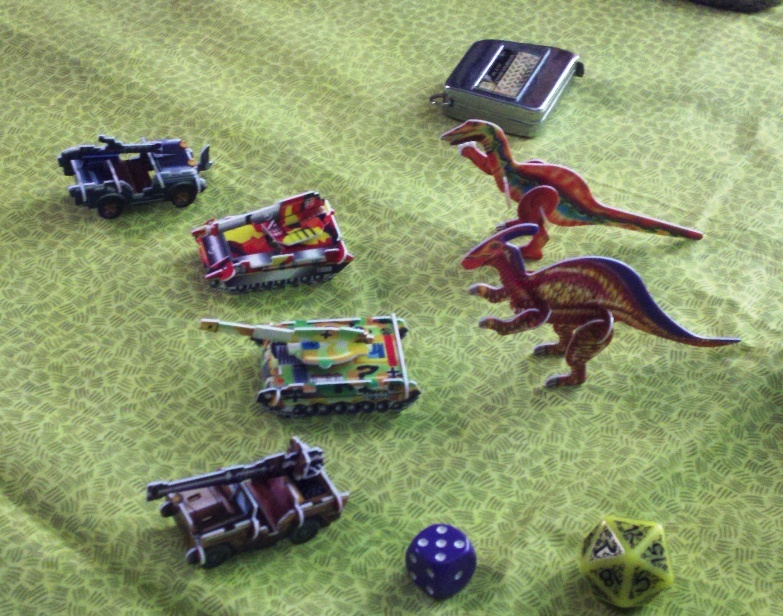 Unfortunately, the dino attack die of d20 was just too much for the tanks' d10 & tank destroyers' d6 & my dinos started quickly knocking off her vehicles. 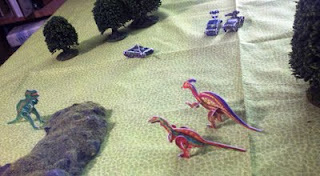 Seeing that she was getting disappointed, I "accidently" started rolling a d12 for the dinos instead of a d20, & allowed her to roll 2d6 for her tank destroyers when they fired at the same target. She finally (luckily) beat me & ran off to tell Mom about her glorious victory. I was very happy she enjoyed it & was very active in wanting to play the game, doing her own measuring & making her own tactical decisions. At the end of the game, she asked me if I could "put the game on Facebook". I was quite surprised since she's never mentioned Facebook before & only uses computers to play cartoon games like on Disney & Nick Jr. But this blog is as close as I get to Facebook, so it'll have to do. Now I need to go write down the rules I came up since I know she'll start correcting me next time we play if I don't. Been unable to get myself motivated to work on any wargaming project for a long time. So, I used a recent Warmaster campaign day as impetus to finally get something done. I dug out the Warmaster terrain pieces that I'd had for years since they'd be a quick & simple project. I ended up finishing the pieces themselves in about 9 hours. & then about another 2.5 hours to do the bases. The buildings are all from JR Miniatures 10mm Ancient/Medieval range. 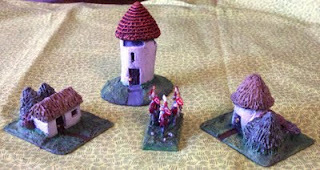 I primed them white and block painted them, with a bit of drybrushing, & finished them off with the Minwax Miracle Dip method. The buildings are mounted on a variety of hotel card keys, used gift cards, etc. Unfortunately, some are already starting to flex & the basing material is lifting off. These stones are actually bluish. 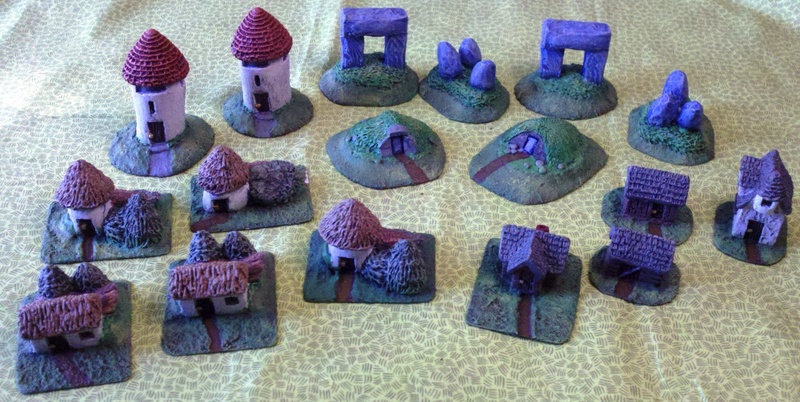 I wanted them to look a bit more magical than just grey standing stones. Now I just need to make a river for these bridges to go over.